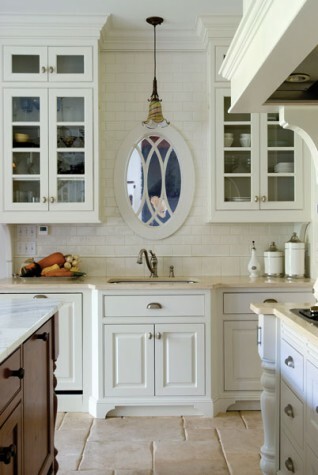 The cabinetry of the kitchen island is made of English yew, and its countertop is of Calcutta gold marble. An interior window allows the homeowners to see who is coming through the front door while at the kitchen sink. The home’s new dining room and renovated “Ocean Room” allow for waterfront views that were previously obscured. The foreground shows a custom chandelier of crystal beads and weathered mahogany. The renovation involved expanding past the original walls of the home. As a result, the exterior stone walls became interior walls with stone archways. This corner of the kitchen shows one of those archways, as well as a staircase previously enclosed behind a wall. Freshwater Stone in Orland replaced the Ocean Room’s original floor-to-ceiling fireplace, which had cracked after a chimney fire. Elsewhere in the house, new stonework was intended to mimic the home’s original walls, with a beautifully haphazard, farm masonry look. Here the work is more typical of Freshwater’s projects. Large, weathered pieces of stone are assembled with composition and scale in mind. The mantelpiece is of antique chestnut and the artwork is by artist Chase Chen. The front entry features custom doors of a reddish brown wood called sapele. Guests like to use the foyer’s table for puzzles. 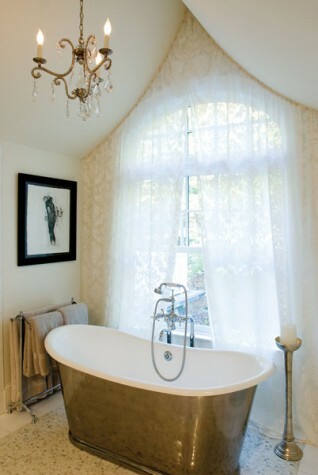 Originally the master bathroom was a bedroom. After the redesign, Connie Dedam of Interiors by Details in Ellsworth suggested using a sheer, pleated curtain for the underside of the curved roof’s peak. Velcro keeps the curtain in place. The multiple windows and glass doors of this turn-of-the-century home are part of an addition/renovation. The eyebrow window is original, and the curved roof gable that is part of a new office mimics the roof curves at the home’s entry. 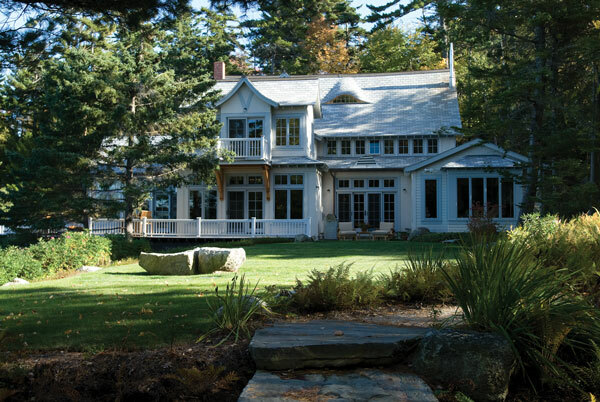 When the couple who own this Bar Harbor home share their address, people sometimes say, “Oh, I’ve slept there.” When they first consulted a local architect about renovating, the architect wasn’t inclined to help. He thought the house was fine as it was. He knew because he’d once lived there. Another architect expressed regret that he was too busy to take on the project. His partner had fond feelings for the home, having spent an anniversary there. Although the homeowners have never spoken with Paul Newman, Christie Brinkley, or Billy Joel, rumor has it that these celebrities, too, have snoozed under their roof. 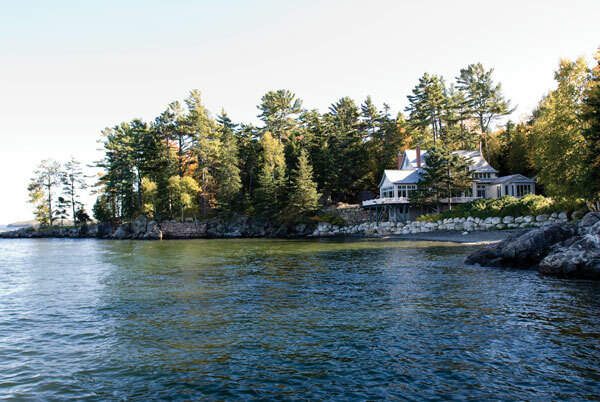 So it goes when you own a 122-year-old home that was operated, for at least some of those years, as a much beloved bed-and-breakfast, site of summer vacations, seaside weddings, and birthday celebrations. But the house had problems. Nowadays, a seaside home is typically built with large windows and glass doors that take advantage of its location. Here, the view was largely closed off. The high windows of the kitchen made the room feel “like somewhere you were being sent for being bad,” according to the wife. The downstairs floor plan made dinner parties awkward, and in the various remodels over the years, one ceiling had been dropped so low that it could no longer accommodate a standard door. In other places, rooms joined oddly, forcing inhabitants to take an awkward step up or down to move about the house. 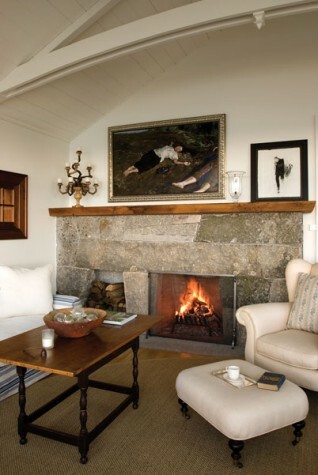 One summer, a chimney fire cracked the Ocean Room’s chimney and necessitated a few changes. The desire for more space suggested a few others. 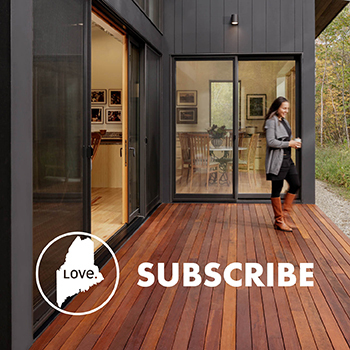 Soon enough, the couple was engaged in a multiyear project to overhaul the entire house. The couple had come to Maine from Virginia. She is a retired real estate agent. He is a retired CEO of a management consulting firm for Fortune 500 companies. They chose a cooler climate for health reasons, but before reaching this decision, they had considered building a house in Washington, D.C., and they had consulted with Anthony “Ankie” Barnes of Barnes Vanze Architects. He showed them a home that impressed the couple for being casual and comfortable, but also appropriate “for entertaining ambassadors should you wish,” according to the wife. Although they ended up saying no to building in D.C., they contacted Barnes again when they were ready to renovate in Maine. Now, one might easily describe their new house as the wife once described the gracious D.C. home. The homeowners tend to wear T-shirts and shorts in the summer, but their home feels like an elegant country estate, with handsome furnishings and an art collection that includes small French paintings, a canvas rescued from the attic of a Paris salon, and large-scale figurative paintings by contemporary American artists. To restore the home, the couple also hired William McHenry, an architect from Blue Hill. McHenry says that the aim of the renovation was to make the home “lighter and livelier.” The footprint of the 1889 house couldn’t be expanded much, given the required 75-foot setback. Still, certain areas were “bumped out” on pilings as permitting allowed. 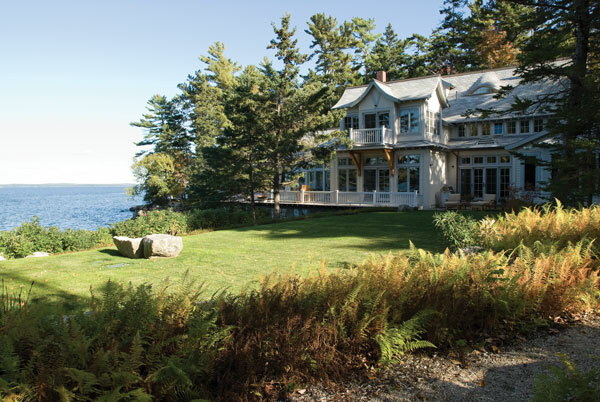 Most notably, an addition was built outside the two-foot-thick stone wall on the water-facing side to create a glassed-in dining room on the first floor and an office for the husband on the second. The Ocean Room was rebuilt to include a vaulted ceiling with cottage-style planks, an interior trussed beam, and new windows and doors. In the process, the builders found evidence of three roofs under the Ocean Room roof, including one that still had some of the original slate. Because the addition turned some exterior walls into interior ones, those granite walls were left partially exposed or shaped into arched passageways that now lead from the old to the new part of the house. “We wanted it to feel like you were leaving the confines of the castle,” says Barnes. Jeff Gammelin of Freshwater Stone in Orland was responsible for the new stonework. 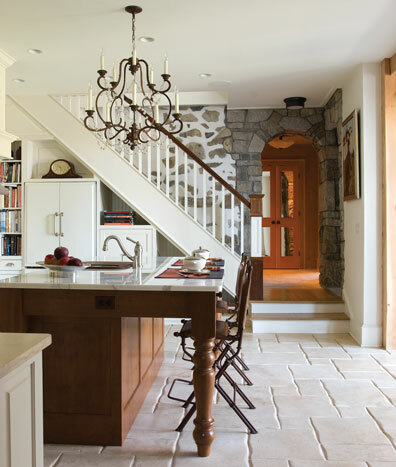 When shaping the archways, Gammelin aimed for “a rustic French farmhouse look to match the stonework that was already there.” The stones chipped out of the walls were later used to build a surround for the dining-room fireplace. Meanwhile, the kitchen was completely redone. Wallpaper and white-steel cabinets were replaced with custom wood cabinetry, custom paneling, a central island of English yew, Calcutta gold marble countertops, an imported stone floor, and new water-saving and energy-efficient appliances. A back staircase that had been hidden behind a wall was opened up, and storage space was tucked beneath the stairwell. A chimney that was formerly between the dining room and kitchen was removed and replaced by a “beverage bar”—a short hallway with pocket doors. Drinking glasses sit on the bar’s shelving. Below the marble countertops, there is a wine cooler and separate pullout drawers for cold drinks and ice. Part of the kitchen’s exterior stone wall was removed and replaced by French doors, sidelights, and a “coffee bar.” Like the beverage bar, the coffee bar is made of English yew and includes cold drawers. Its wood-framed cabinetry mirrors the arch design used in the passageways, barrel vaults, and bookcases throughout the house. A downstairs bathroom made of mosaic tile and slate plank flooring features an open shower with a seat. It’s perfect, the wife says, for when guests come in from a run, when the dog needs to be hosed down, or when someone arrives with mussels from the bay. Upstairs, a bedroom was transformed into a large master bathroom with a bathtub romantically tucked under a flared gable. The master bedroom received a new bay window with a barrel-vault ceiling, window seat, and storage drawers. The new upstairs office has an interior leaded-glass window that opens onto the central stairway, as well as an arch made of a reddish brown wood called sapele. The couple call the small porch off the office a “cigar” porch, because that’s where the husband goes to smoke cigars. Old photos show the Bar Harbor house with brown timber, brown shutters, and yellow stucco. Now the shutters are gone, and the façade has been redone with gray timbers made from a weather-resistant material and a beige stucco finish called Dryvit. 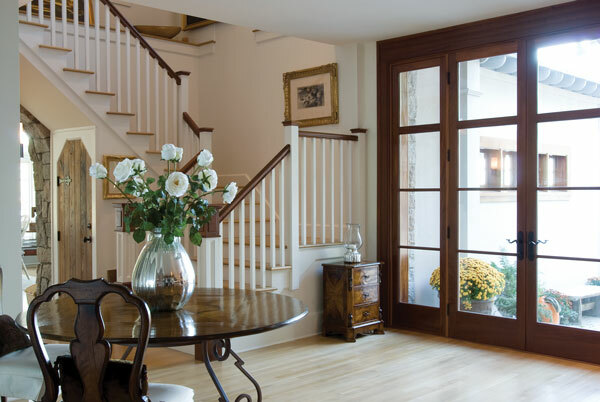 The front entryway has been refashioned with large, custom sapele doors and sidelights. The hidden parts of the house were also improved. The electricity and plumbing are new, as is a fuel-efficient furnace (placed in a mechanical closet on the first floor) and an oil tank located outside the house. In the winter, the pavers used in the front entryway and port-cochère are heated to prevent ice slicks.